Jan-Aage Torp´s Chronicle in Dagbladet: “Does Behring Breivik need Exorcism?” | Live today – build on age-old foundations! Facsimile of Jan-Aage Torp´s chronicle in Dagbladet on Sunday, February 12th, 2012. “TREATMENT: Many Norwegians are wondering whether it isn´t something else that has captured Breivik than simply the crossing between madness and mad thoughts”. – No doubt that we can set Breivik free from the power of demons – if he wants that himself, writes the author of this article. CASTING OUT DEMONS: A father attended the imprisonment meeting on February 6th for Anders Behring Breivik, according to VG, to “actually see the devil before the case starts”. On February 15th, 2009 VG splashed out on the whole cover page my own son, Anders: “Accuses his father of casting out devils”. On April 15th, 2011 Aftenposten followed suit with «Casting out demons» on their front page. Is it only empty words that makes a father want to “see the devil”? Was it only imaginations that Anders spoke to the newspapers about? 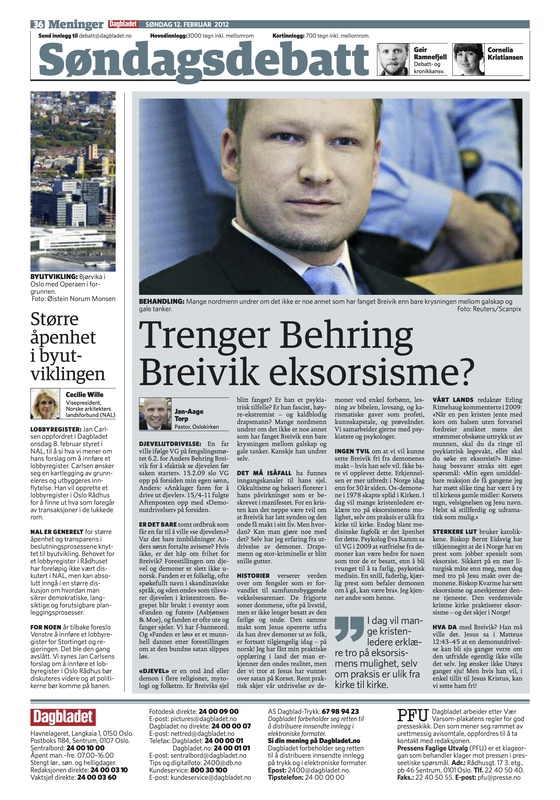 If not, is there hope of freedom for Breivik? The notion of devil and demons is by no means un-Norwegian. “Fanden” (translator comment: a popular form for “devil”) is a popularized, often joking name in Scandinavian languages, and “the evil one” equals the devil of the Christian faith. The term is used in a fairy tale such as “The Devil and the Bailiff” (Asbjørnsen & Moe), and “fanden” is often out to capture souls. We have “fanden”-profanities. And “Fanden is loose” is an adage that is formed based on the notion of the bound satan who will be let loose. “Devil” is an evil spirit in several religions, mythology, and folklore. Has Breivik´s soul been captured? Is he a psychiatric case? Is he a fascist, extreme rightist – and coldblooded murderer? Many Norwegians are wondering whether there is something else that has captured Breivik than simply a crossing between madness and mad thoughts. Perhaps he is wondering himself. In that case there must have been entry channels into his soul. Occultism and witchcraft abound in the influences that are described in the manifesto. For a Christian there can hardly be any doubt that Breivik has let sin and the evil one gain power over his life. But how? Can something be done about it? Personally I have experience from casting out demons. Murderers and big criminals have become good boys. Stories abound worldwide about prisons that have been transformed into community building revival arenas. The liberated ones serve their sentences, often for life, but are no longer possessed by the dangerous and evil one. The same authority that Jesus operated under when he cast demons out from people, is still available today – in Norwegian! I have received my practical training in nations where the reality of the evil one is acknowledged, but we believe that Jesus has defeated satan on the Cross. In practical terms our deliverance from demons is done through simple prayer, Bible reading, praise and worship, and charismatic gifts such as prophecy, word of knowledge, and discerning of spirits. We readily cooperate with psychiatrists and psychologists. No doubt that we will be able to set Breivik free from the power of demons – if he wants that himself. Not only we experience this. The recognition is broader in Norway today than 30 years ago. The “Os demons” in 1978 (translator comment: Atheist media exposed Lutheran efforts at exorcism at Os, near Bergen) created division in the Church. Today many Christian leaders will declare belief in the possibility of exorcism, even though the practice varies from church to church. Even among medical professionals there is an openness to this. Psychologist Eva Ramm said to VG in 2009 that “deliverance from demons can be better for someone that believes they are possessed, than to be coerced into taking dangerous, psychotic medicine. A kind, fatherly, loving priest who commands the demon to go, can be good”. I know others like her. Vårt Land´s (translator comment: a liberal-Christian newspaper) editor Erling Rimehaug commented in 2009: “When a pretty Christian girl with a cross around her neck without forewarning warps her face while a stream of obscene expressions come out of her mouth, should you then call psychiatric 911, or should you approach an exorcist?” Rimehaug immediately answers his own question: “My own immediate reaction on the few occasions when I have encountered such things is to rely on the old means of the Church: the sign of the Cross, the benediction, and the name of Jesus. Preferably as quietly and undramatic as possible”. Stronger measures are used by the catholics. Bishop Bernt Eidsvig has acknowledged that they in Norway have a priest who works specifically as an exorcist. Surely in a more liturgical way than me, but still with belief in Jesus´ authority over demons. Bishop Kvarme (translator comment: Church of Norway bishop of Oslo) has seen exorcism and acknowledges this ministry. The worldwide Christian Church practices exorcism – and it is happening in Norway! What then with Breivik? He must want it. Jesus said in Matthew 12:43-45 that deliverance from demons can become seven times worse if the delivered one really didn´t want it himself. I don´t want Utøya times seven! But if he wants this, in simple faith in Jesus Christ, then we can set him free! Jan-Aage Torp - married to Aina; born in Japan; raised in Thailand; educated in USA; President for European Apostolic Leaders (EAL); Chairman of Christian Coalition World (KKN); Pastors Oslochurch with Aina. Gallery | This entry was posted in English. Bookmark the permalink.